Molly Ashe and Balous Day Date. Photo © Sportfot. Lexington, KY – Equis Boutique, a luxury shopping experience for the discerning equestrian, awarded coveted “Best Presented Horse” honors to Molly Ashe and Balou’s Day Date this weekend after Thursday’s FEI Horse Inspection at Split Rock Jumping Tour’s Bourbon International CSI 3* in Lexington, KY.
Ashe and Balou’s Day Date, owned by Louisburg Farm, took part in FEI competition at Split Rock Jumping Tour’s second 3* event this year after its premiere show, the Lexington International CSI 3*, kicked off in May. In addition to the Equis Boutique “Best Presented Horse Award”, Ashe and her 10-year-old Oldenburg Mare (Balou Du Rouet x Linda-Dolores) placed fifth in Sunday’s $100,000 CSI3* Grand Prix against a starting field of 36. Equis Boutique is the most convenient and luxurious choice for top equestrian brands to dress the horse and rider, including Parlanti, Anna Scarpati, Kingsland Equestrian, Kentucky Horsewear, Dy’on, specialty imported bits, as well as Official FEI and Just World International merchandise. Continuing their dedication to excellence in all areas of horse sport, Equis Boutique has devoted their presence at North American horse shows to enhancing the importance and prestige of the FEI Horse Inspection. Ashe’s award commended the overall turnout of both her and her horse after evaluation by the Split Rock Jumping Tour FEI Ground Jury, made up of Jenny Ross-Koning (USA), Bobby Murphy (USA), Leslie Brown (USA), and led by President Jonathan Taylor (CAN). She and Balou’s Day Date were presented with a commemorative silver plate, as well as assorted products from Equis partner brands for the honor. Balou’s Day Date is meticulously cared for by Louisburg Farm groom Ezequiel Remigio, who took her over at the end of the 2015 season in Florida. “You could see how proud he was to earn the award – she [Balou’s Day Date] can do no wrong in his eyes,” added Ashe. Equis Boutique was founded in 2014 by FEI judges Elena Couttenye and Cesar Hirsch, and in addition to creating a mobile, one-stop shopping opportunity for high-end international riding apparel within the American market, they wanted Equis to elevate FEI Horse Inspections with a little friendly competition among owners, riders and grooms. From that idea, the Equis Boutique “Best Presented Horse Award” was born and has been given at nearly ten horse shows across the U.S. so far this year. These shows include both weeks of the Split Rock Jumping Tour, as well as the 2015 FEI World Cup™ Finals in Las Vegas, NV and the Rolex Kentucky Three-Day Event at the Kentucky Horse Park. Equis Boutique made a successful debut season at WEF in Wellington, FL and HITS Horse Shows in Ocala, FL this winter, and has had a busy summer season at horse shows around the U.S. For a complete schedule of Equis Boutique locations, visit equisboutique.com/find-us. Molly Ashe Cawley and Kennzo. Photos by Emily Riden. Wellington, FL – December 2, 2013 – For the last two years, Molly Ashe Cawley and Kennzo have kicked off the holiday season by earning a bit of an early Christmas present. On Sunday afternoon, that holiday gift came in the form of their second consecutive victory in the $15,000 Holiday & Horses USHJA International Hunter Derby at the Palm Beach International Equestrian Center. Ashe not only won the derby aboard Kennzo, but she also finished third in the class with Original Du Rietz, earned ribbons in the open jumpers aboard Carissimo and helped coach Norfield Stables LLC rider Francesca Dildabanian to the Large Pony Hunter Championship. Thanks to their numerous wins, the Holiday & Horses Show marked a fantastic start to the holiday season for the Newtown, CT based Norfield Stables LLC, at which Ashe trains alongside Timmy Kees and her husband Chris Cawley. The $15,000 Holiday & Horses USHJA International Hunter Derby also marked Kennzo’s first time in the show ring since the Hampton Classic Horse Show in August. Kennzo, owned by Kristen Abbatiello-Neff, and Ashe were undoubtedly both on it from the get-go on Sunday. Their efforts over the first round classic hunter course, designed by Jason Shelley, shot them straight to the top of the leaderboard. Scores of 88 from the first judging panel and 87 from the second panel, plus four high option bonus points added to each score, gave them a total first round score of 183. Ritzy cemented the third place finish with judges’ scores of 80 and 85 in the second round for a total second round score of 184, including handy bonus and high option points. With riders returning in reverse order of their first round standings, it came down to Ashe on Kennzo and Kelley Farmer on Skorekeeper, owned by Larry Glefke. Farmer and Skorekeeper earned impressive scores of 87 and 87.5 for a second round total of 200.5 and an overall grand total of 374, leaving it all up to Ashe and Kennzo. “I felt like I had to just not mess it up, instead of trying to scratch and claw my way ahead of somebody,” Ashe explained. Far from messing it up, Ashe and Kennzo turned in a beautiful trip, earning them a grand total, two-round score of 382 and ensuring them the win. While Ashe earned her win in the Mogavero Ring, nearby in Ring 7, young Norfield Stables LLC rider Francesca Dildabanian was doing some winning of her own. The young competitor from New York, NY, and her own large pony, Pride, earned three blue ribbons over fences and the top call in the Large Pony Hunter Model before being named the Large Pony Hunter division champions. Dildabanian plans to continue showing Pride in the Large Pony Hunters throughout the winter season, as well as competing in the Children’s Jumpers and equitation divisions. She and much of the Norfield Stables team will look to continue their successful 2013 show year at the upcoming Equestrian Sport Productions Holiday Horse Show Series. Norfield Stables LLC is a full service hunter/jumper facility run by Molly Ashe Cawley, Chris Cawley and Timmy Kees. Ashe is an accomplished show hunter rider who joined the grand prix tour in the late ’90s. In 1999, Ashe captured her first major grand prix victory during the $50,000 Grand Prix of Lake Placid aboard Rosewood Glen Ltd. Resolute. Since then, Ashe has won awards throughout Europe and the United States. With over 25 years’ experience on the “A” horse show circuit, Kees is one of the country’s most prominent hunter/equitation trainers. His riders have won the ASPCA Maclay, AHSA Medal and USET Equitation Finals a total of seven times. Kees has also trained hunters such as Holy Smoke, Watership Down, So No Wonder, Castaway and Double Cinco to championships at Devon, Harrisburg, Washington and New York. He is an USEF “R” judge and conducts clinics throughout the country. For more information, please email fjbmcb@gmail.com, and find Norfield Stables LLC on Facebook here. Molly Ashe and Kennzo. Photos (c) Mancini Photos. 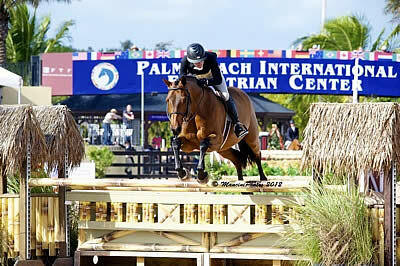 Wellington, FL – December 1, 2013 – Equestrian Sport Productions’ Holiday & Horses competition concluded at the Palm Beach International Equestrian Center (PBIEC) on Sunday afternoon with a win for Molly Ashe and Kennzo in the $15,000 USHJA International Hunter Derby. Laura Kraut and Bonito R ended the week with a victory in the $10,000 Open Jumper 1.40m Stake class. The $15,000 Holiday & Horses USHJA International Hunter Derby was held in the Mogavero Ring at PBIEC featuring two rounds of competition over a course set by Jasen Shelley. The judges included Danny Robertshaw, Kitty Barker, John Barker, and Jim Zulia. Molly Ashe jumped Kristen Abbatiello-Neff’s Kennzo, an eleven-year-old Finnish Warmblood gelding by Coriano, to victory with two beautiful rounds of competition. Ashe and Kennzo earned the high score of 183 in the classic round and then received the second highest score of 199 in the handy course to finish with 382 points overall. Kelley Farmer and David Glefke’s Skorekeeper had the high score in the handy round with 200.5 points, which combined with their classic score of 173.5 to give the pair a 374-point total and second place honors. Kennzo mainly shows in the hunter derby classes with Ashe and has proven himself with several wins in the last couple of years, including top honors at Horse Shows by the Bay this summer. He was also third in the derby at the Hampton Classic in August and has not shown since then. Despite the time off, Kennzo came out like a pro on Sunday. Ashe also placed third in Sunday’s class riding Elisee Browchuck’s Original du Rietz. The pair earned scores of 171 and 184 for an overall score of 355. Havens Schatt and Bruce Duchossois’s Just Fred finished fourth with scores of 163 and 190.5 for a score of 353.5 overall. Jennifer Bliss earned fifth and sixth place honors riding Harris Hill Farm LLC’s Poker Face and Extraordinary. Poker Face earned scores of 156 and 186 for a total of 342 to place fifth. Extraordinary received a 145 and a 183 for a 328-point total and the sixth place prize. A $10,000 Open Jumper 1.40m Stake class concluded the competition on Sunday with a course set in the International Arena by Anthony D’Ambrosio. Twenty-eight entries showed in round one with five clear rounds to advance to the jump-off and five double clears over the short course. The fastest time of 37.946 seconds earned top prize for U.S. Olympic Gold Medalist Laura Kraut riding Stars and Stripes’ Bonito R, an eight-year-old Hanoverian gelding by El Bonito x Rhytmo. New Zealand’s Grant Wilson finished second riding Octavia de Beaufour, owned by Emmanuelle Mille and Grant Wilson. The pair cleared the short course in 38.411 seconds. Denmark’s Henrik Gundersen finished third riding Adlanteur through the timers in 39.609 seconds. Young U.S. rider, Sydney Shulman, took home both the fourth and fifth place honors. Shulman and Marcus Hagglund’s Quirado finished fourth with a time of 39.932 seconds. Riding Back Country Farm’s HH Narcos du Marais, Shulman placed fifth in 40.661 seconds. Sunday’s competition concluded the 2013 Holiday & Horses event. Equestrian Sport Productions will host its Year End Awards Show next at PBIEC. The competition will run December 7-8, 2013, featuring a $10,000 Open Stake on Saturday, December 7, and the $25,000 Year End Grand Prix (2 p.m.) and $5,000 USHJA 3′ Hunter Classic on Sunday, December 8. The ESP Year End Awards Banquet will be held on Saturday, December 7, at approximately 6:00 p.m. in the PBIEC Special Events Tent. For more information, please visit www.equestriansport.com. For full results, please visit www.showgroundslive.com. Molly Ashe Cawley and Kennzo topped the 39 horse field to win the $20,000 USHJA International Hunter Derby at Horse Shows by the Bay. Photo courtesy of Tricia Booker. Traverse City, MI – July 24, 2013 – Molly Ashe Cawley and Kennzo rode away with the victory in the $20,000 USJHA International Hunter Derby at Horse Shows by the Bay on July 19, marking just one highlight of an extremely successful week for Norfield Stables LLC. Ashe and the talented 11-year-old Finnish Warmblood gelding finished the first round of the hunter derby securely in second place in the competitive 39 horse field, heading into the handy round just behind Kelley Farmer and Mythical. Last year in the same class, Ashe also came back in second place for the handy round, but last year she was personally disappointed with how she rode it. This year, she came back ready to redeem herself. “From the first round to the second round, [Molly] came in the ring and galloped the first jump and didn’t take a couple of cautious jumps and start to get comfortable with the course, which I think separated her in both rounds. She showed us right from the beginning that she was trying to win, which she ended up doing,” judge Chris Wynne commented. Ashe’s smart riding and decision to avoid the inside turns helped Kennzo to deliver a stellar performance, earning them a combined two round total score of 370, moving them easily in to the lead but with Farmer and Mythical still to return. Farmer knew that she’d have to pull out all the stops in order to top Ashe’s score, but unfortunately the second sharp turn that Ashe had avoided proved to be the downfall for Mythical, guaranteeing the well-deserved victory for Ashe and Kennzo. With Ashe at the reins, Kennzo, owned by Kristen Abbatiello-Neff, has consistently proven to be a top derby mount with wins at numerous derbies including the $50,000 USHJA International Hunter Derby at the 2012 Hampton Classic and the $20,000 Holiday & Horses USHJA International Hunter Derby in Wellington, FL. Most recently he and Ashe took the top call in the $5,000 New England Hunter Derby at the Fairfield County Hunt Club, just weeks after Ashe underwent back surgery. Following her surgery, Ashe was quickly back in full-force, not only in her own riding but also in coaching other riders to the top of the leaderboard. Among the gifted pupils from Norfield Stables LLC, which Ashe runs alongside Chris Cawley and Timmy Kees, is Francesca Dildabanian. Under the Norfield Stables tutelage, 11-year-old Didlabanian and her pony Pride racked up the blue ribbons in Michigan, winning the $1,000 Horse Shows by the Bay Pony Hunter Classic, the Large Pony Hunter Championship and the Grand Pony Hunter Championship. Norfield Stables LLC’s success during week three of the Horse Shows by the Bay Equestrian Festival was not limited to the hunter ring. 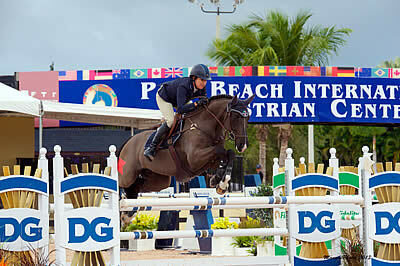 In the jumpers, Ashe rode Lincourt Gino, owned by Monica Carrera, to a blue ribbon in the $1,500 1.35m Jumpers. Lincourt Gino then returned to the ring with Carrera to earn another blue ribbon, this time in the $750 Low Jr/A-O Jumpers. Also in the Low Jr/A-O Jumpers, Ashley Prusak and her mount Rabin rode to back-to-back second place finishes, earning them the division reserve championship. Keeping it in the family, Jamie Prusak placed well in every class of the Low Adult Jumper division aboard Waldo De Kalvarie, while Ashley Prusak’s sister Samantha Prusak made her High Jr/A-O Jumper debut on Goed Zo. “The horse went beautifully, and it looks like they have a promising future in the High Jumpers,” Ashe said of Samantha Prusak and Goed Zo. Rounding out Norfield’s success in the jumper ring was Olivia Jack on both of her mounts, Valdez and Executive Privilege 3e. She and Executive Privilege 3e rode away with a blue ribbon in the $1,250 1.30m Jumpers, while just one light brush of rail kept her and Valdez from the blue ribbon in the $5,000 Low Junior/A-O Jumper Classic. Finally, in addition to Ashe’s win in the $20,000 USHJA International Hunter Derby, she finished ninth in the class with newly turned hunter, Original Du Rietz, or “Ritz,” owned by Elisee Browchuk. Norfield Stables LLC returns today for the fourth and final week of competition at Horse Shows by the Bay. To learn more about Norfield Stables LLC, find them on Facebook here. Norfield Stables LLC is a full service hunter/jumper facility run by Molly Ashe Cawley, Chris Cawley and Timmy Kees. Ashe is an accomplished show hunter rider who joined the grand prix tour in the late ’90s. In 1999, Ashe captured her first major grand prix victory during the $50,000 Grand Prix of Lake Placid aboard Rosewood Glen Ltd. Resolute. Since then, Ashe has won awards throughout Europe and the United States. With over 25 years’ experience on the “A” horse show circuit, Kees is one of the country’s most prominent hunter/equitation trainers. His riders have won the ASPCA Maclay, AHSA Medal and USET Equitation Finals a total of seven times. Kees has also trained hunters such as Holy Smoke, Watership Down, So No Wonder, Castaway and Double Cinco to championships at Devon, Harrisburg, Washington and New York. He is an USEF “R” judge and conducts clinics throughout the country. For more information, please email fjbmcb@gmail.com. 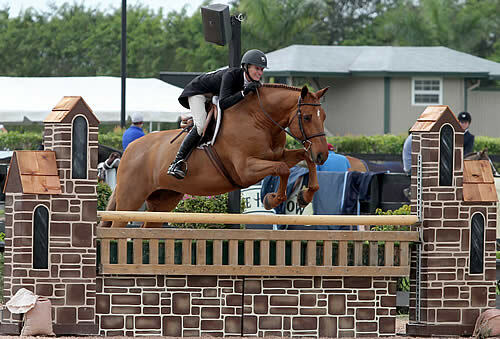 Wellington, FL – December 2, 2012 – Kristen Abbatiello-Neff’s Kennzo and Molly Ashe jumped their way to victory in two rounds of competition in the $20,000 Holiday and Horses USHJA International Hunter Derby, presented by Dietrich Insurance, on Sunday, December 2, 2012. Concluding the week-long competition, the class was held in the spacious International Arena at the Palm Beach International Equestrian Center with a beautifully designed course set by Skip Bailey, of Wellington, FL. The class was judged by two panels, including Danny Robertshaw and Scott Williamson on panel one and Robert Bielefeld and Julie Winkel on panel two. For their victory, Kennzo and Molly Ashe earned the high scores in both the classic round and the handy round for the winning overall total. The pair scored a 175 in round one and a 201 in round two for a two round total of 376.